As part of a wider series of small interventions across the field (Last 2017; Roberts et al. 2017), Historic England archaeologists excavated a 4x4m trench over the northern ditch terminal of WS71's western ditch. 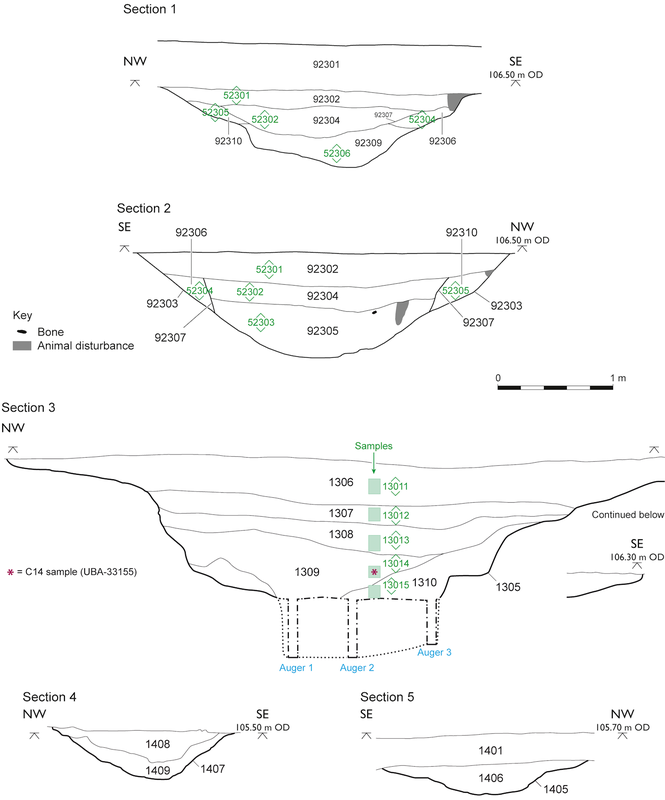 Topsoil was removed by a mechanical excavator, revealing the terminus of a single substantial ditch, 3.26m wide and 0.91m deep with gently sloping sides and a U-shaped base (Figure 6). A single section was hand-excavated across this feature (Figure 7). The terminus had a gentle slope to the south-west that continued downwards beyond the section, indicating that the main ditch was probably deeper. 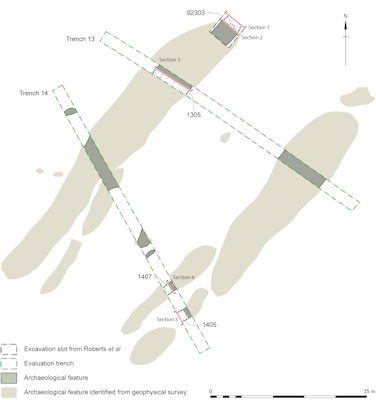 The primary ditch fill was 0.32m deep and rich in chalk, suggesting rapid deposition after its initial construction, probably via erosion of the ditch sides and possibly the mound. The secondary ditch fills were also quite chalky, suggesting continued erosion and deposition. Worked flint from the primary fills indicated a Neolithic date, although there was only a small assemblage. No suitable material for secure scientific dating was present in either of these fills. These fills were then very substantially cut by a steep-sided recut through most of the ditch, centrally located so as to leave a small quantity of fill in each side of the primary ditch cut. The recut fills were considerably less chalky than the fills of the primary ditch. By the time the recut was allowed to fill up its cut and any adjacent mound or bank had stabilised, presumably through the growth of covering vegetation, accounting for the reduced quantity of chalk within these fills. The worked flint assemblage from the fills of the recut suggests that the silting process started during the Late Neolithic and the small sherd of Beaker pottery present in the uppermost fill of the recut suggests that silting continued into the Early Bronze Age. Full details of the lithic assemblage are presented in Appendix 1. Six flotation samples, all of 30-40 litres in volume, were taken from the primary fills of the eastern end of the ditch and the recut (three from each). No charred remains were present other than occasional fragments of charcoal in three samples. Full details are given in Appendix 2: Charred Plant Remains. A total of seven countable animal bones were recovered from fills of the recut. Sus sp. and Bos sp. were recovered, the latter possibly including aurochs. All of these assemblages are too small to allow much interpretation, but will be of use when considered alongside assemblages from the excavations by Wessex Archaeology. Full details are given in Appendix 3: Faunal Remains. 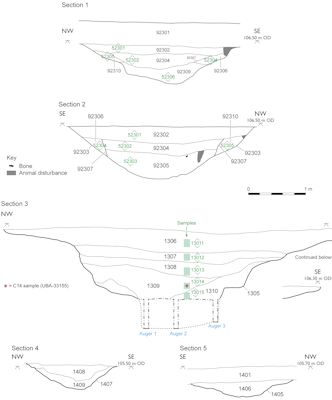 A sequence of mollusc samples from the excavated section suggests that the ditch was initially dug in an open grassland environment, with shade increasing by the time the secondary fill was accumulating. This shade is unlikely to have been from woodland, but instead probably derives from longer grassland around and perhaps within the ditch and it appears that a stable long grassland environment, possibly with some shrubs, continued throughout the period of recutting and its gradual infilling. 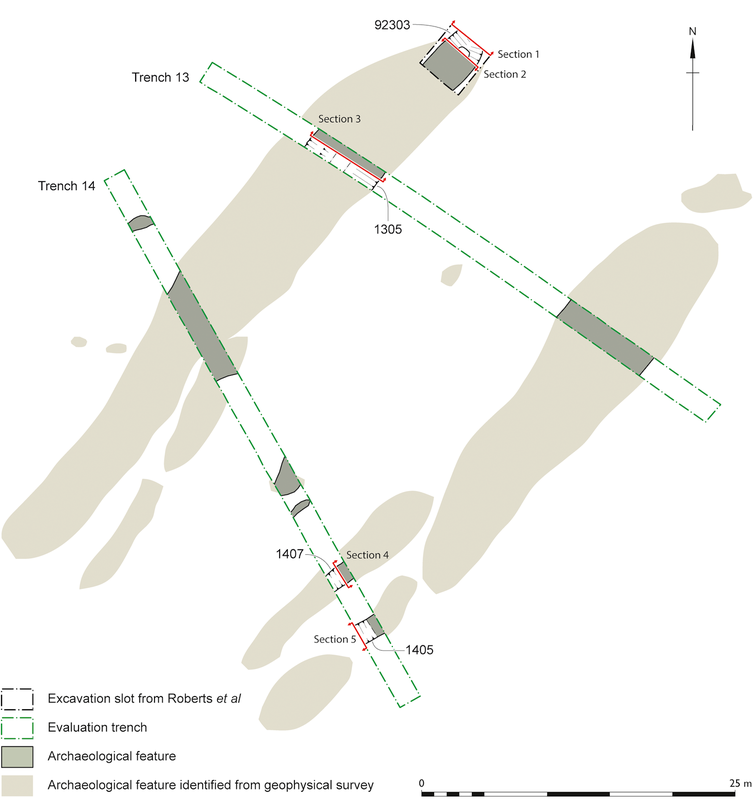 This is a similar sequence to South Street long barrow on the North Wiltshire Downs (Evans 1972, 328–332). Full details of the molluscs are given in Appendix 4: Molluscs.